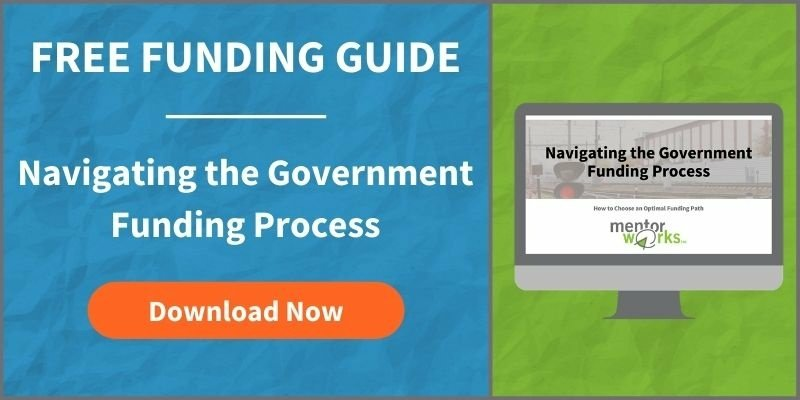 Navigating the Canadian government funding process can be challenging for businesses of all sizes. Optimizing the planning, writing, submission, and reporting process can take considerable time and resources; however, there are tremendous benefits associated with accessing funding regularly. Companies should take time to familiarize themselves with the options available when completing the Canadian government funding process to ensure they receive the greatest outcome possible. If you have questions about accessing business grants and loans, please review the information on this page, which we’re regularly asked about by Canadian companies. Our library of small business funding resources can also help independent evaluation of government funding programs. When you’re ready to discuss how Mentor Works can improve the funding process, contact us online or call us at 1-888-599-3111. What Canadian government grants and funding programs are available? How do I find out more information? Both the provincial and federal governments offer small business funding programs and services. There are two common ways companies search for Canadian government funding programs, including looking by their province/operating region and exploring by their project/investment area. Companies can also refer to our library of programs for a comprehensive view of the various small business funding grants and low interest repayable loans available to Canadian businesses. What are the eligibility factors for Canadian government funding? In order to be eligible for any Canadian government funding, businesses need to be incorporated for at least three years and have at least five people on payroll, although each program has their own eligibility requirements. This is to establish the financial stability of the organization. Generally speaking, most Canadian government grant programs are positioned to support incorporated small and medium enterprises (SMEs) and large corporations. Please consult our Canadian Small Business Funding Guide for more information about funding eligibility criteria and access our blog for program-specific eligibility factors. Do I need to have more than 100 employees to apply? No. There are many programs that support from 1 to 50 employees. Canadian government grants and loans are tailored to support small businesses and each have their own eligibility criteria. Are Canadian small business grants only applicable for incorporated companies? No, there are Canadian small business funding programs available for unincorporated businesses, although this funding is limited. If you are unsure about whether or not your Canadian small business qualifies for grants and loans, contact us to learn more. Is my financial performance important? Do I need a business plan? To be awarded Canadian government funding, a business’s financial health is important. Generally, a current balance sheet and income statement must be submitted with the application. At minimum, some financial information will be required, such as a letter from your financial officer. There are also several Internet resources to support the planning components. As part of our process, we support the development of customized business and project plans to act as supporting documentation for your funding application where necessary. How does Canadian government funding compare to SR&ED tax credits? The process for obtaining tax credits and incentives is significantly different. It is often more complex and time consuming to pursue tax refunds compared to the typical Canadian government grant process. We’ve also seen the complexity of the claims process increase in recent years while the total value of claims is decreasing. As well, business owners are only entitled to SR&ED tax credits once per year. As such, no immediate or regular cash flow improvements are gained. Small business grants and Canadian government funding programs are available at different points throughout the year and can provide immediate cash flow impacts and direct support to upcoming projects. Learn more about the differences between government grants and SR&ED tax incentives. Can I obtain business expansion funding support with Canadian government grants and loans?? There are a number of small business grants and repayable loans that focus on business expansion. These types of funding programs often seek to help businesses increase production to serve a greater portion of the domestic or international market. Projects generally include the expansion of facilities, adoption of innovative equipment, hiring and training employees, and development of new markets through ambitious marketing and sales efforts. Many government programs, whether federal or provincial, focus on creating highly skilled jobs and increasing long-term employment opportunities. Consider business expansion funding if you can add jobs, and achieve sustainable growth. Does the Canadian government support expansion plans into the United States or globally? A primary objective of government funding is to keep highly skilled talent in Canada, increase the number of skilled jobs in Canada and ensure their long-term sustainability. As long as expansion plans ensure jobs are maintained at a Canadian-based operation, the financing options to expand are significant. To strengthen your business’ export expansion plans and learn how to access Canadian government funding for exporting, download the Canadian Business Guide to Export Expansion. Do Canadian government funding programs support startups? Yes, but not to the same extent as established SMEs. Generally you need to be incorporated for at least two years to apply for non-repayable funds (small business grants), but there is a considerable amount of funding to support activities such as product and process applied research, engineering design, technology acceleration, product testing, certification, marketing studies, proof of concept, piloting and demonstration, and pre-commercialization activities. You can focus on groups like MaRS that provide market research studies and business project support from local universities and colleges. Mentor Works also offers resources for startups and entrepreneurs. Startups can download our Free Funding Checklist to align your business for future funding success. Regional Innovation Centres (RICs) are another good source for provincial and federal funds. They also provide great business planning tools and support to help you determine the right strategies for growth. As a first step, contact your local business centre for more information on startup resources and support. I am interested in hiring recent post-secondary graduates. Are there Canadian government funding programs available? Across Canada, there are various hiring grants to subsidize the onboarding of new graduates. These programs are often specifically targeted towards particular industries, however some are more general and can support a wide range of employers or employees. Many government supported programs require that you find your graduate before applying. This is not optional – it is part of the process. To be an eligible hire, many post-secondary hiring grants require that the college or university graduate is not currently employed in their area of expertise or already employed at your business. Graduates should have graduated in the last 3-5 years. Some have age requirements as well – most often under 31 years. Some wage subsidies will only provide incentives for hiring from certain programs (i.e., science, technology, engineering or math, and marketing). Post-secondary hiring funds are most plentiful in the spring and summer each year when the majority of new graduates are ready to enter the workforce. Companies can plan to ramp-up recruitment around this period of time to get the most value out of Canadian business hiring grants. To discover currently available funding programs, please tell us more about the position you’re recruiting for via our Wage Subsidy Identifier contact form. Do Canadian government funding programs only support research and development? No. Funding programs currently support many different areas of business, from research and development to capital investment to business expansion and human resources. Training, lean manufacturing & design, export expansion, workforce expansion, IT best practices, and energy efficiency projects are common activities that receive funding. That is not to say the government does not recognize the importance of R&D in terms of our economy. Keeping talent in Canada is dependent on collaboration and partnerships with innovative businesses and R&D facilities at our post-secondary institutions. Is there government support for commercialization and development? There is more support for innovative research and development now than ever before in Canadian government funding. Disruptive technology development, demonstration, and deployment is a key area of the government’s strategic investment initiatives. The Industrial Research Assistance Program (IRAP) is generally a great program to start with, as it supports research and development projects of all sizes. Browse research grants and repayable funding to explore a wider range of options. Are there Canadian government funding programs available for the retail or distribution sector? Not usually, since the government evaluates risk similar to how banks do. The government likely sees retail as higher risk, so funding is limited in this case. But this doesn’t mean all avenues of funding are blocked off. Focus on regional centres like CFDC and Small Business Centres as well. You may also be able to leverage hiring and training funding. Are there Canadian government funding programs available to support manufacturing companies? Many Canadian business funding programs favour industrial and manufacturing companies. This is because product design, research, development, and production enhancement projects are most likely to lead to spin-off benefits throughout the Canadian economy. Manufacturers can start the government funding process by searching for funding by project type. Because of the high number of potential government funding programs manufacturers can apply for, we advise contacting Mentor Works to build a customized funding strategy that is aligned to your business’ upcoming growth opportunities. I am in a distressed manufacturing region. Does this play a role in the approval process? Dependent on the objectives of the funding program, this could be a significant factor in the approval process. Usually this is related to larger programs that establish a repayable loan with at least 50% support from the business. Grants for small business and Canadian government funding programs usually stress the importance of job creation, so this may play a more important factor than region depending on the program. How do I know which programs are suited for my business and growth strategies? The first step of the Canadian small business funding process is to determine your priorities. Determine your business plans and projects for the next 12-24 months, then review programs to see what fits, and select the Canadian government funding programs that best suit your projects. Using external support services can help this process. Government Funding Planners can curate a list of programs that provide the most support for your projects, this reduces your internal labour requirement significantly. Is the application process complicated? The application process is unique to each project and program. Review the requirements for each application or program and evaluate the risk, benefit, timelines and objectives before you begin. Most government funding applications require a compelling story to be told about a particular project. Companies should focus on explaining key benefits, including how productivity, innovation, and employment will change as result of the project. Speaking directly towards the specific focus and evaluation criteria of each program will help demonstrate high-quality projects. This is why engaging external support services, such as Mentor Works, is so valuable. How long do I have to wait for approval on these programs? Approval periods depend on the scope and complexity of your project and the Canadian government funding program. Some programs respond after as little as 48 hours, some take 4-6 weeks, while others may require a 4-10 month waiting cycle once the online application is submitted. You should carefully research this information to set clear expectations, and to ensure that you carry out the correct activities for the specific funding program – so there are no additional delays. Many grant and loan funding programs will not fund activities that have already occurred. If you are looking for retroactive funding, tax credits and incentives are your best options. Additionally, depending on the program there may be specified intake periods during which applications are accepted so you will need to time your application and project accordingly. What is the success rate for approval? This is dependent on the program that you apply for and whether you correctly address the program objectives and critical factors, such as eligible activities and expenses. Even if your application meets all of the program criteria, there is no guarantee that your application will succeed, however there are steps that your business can take to maximize your funding success rates. Before you apply, be sure to carefully review the objectives of the funding program. If you cannot fully meet the requirements, move on to the next program. When you find a program where you can match all the criteria, your success rate will be much higher. Need support? Contact Mentor Works to identify the government funding programs and support the application process. Does the government track progress once I am approved? Yes, but tracking methods vary. Some programs require reports each month, some at pre-established milestone dates and some at the end of the program only, where results have to be documented. Progress tracking is often related to how the money is dispersed. Mentor Works can provide insight into the reporting process and assist the follow-up necessary to access funding contributions; this is one more benefit of consulting government funding support. How does a business determine the range of funding available to them? As there are many different Canadian government funding programs available to support a range of projects and business activities, there may be multiple programs that your small business is eligible for. If you’d like to determine what you are eligible for, please contact us directly.